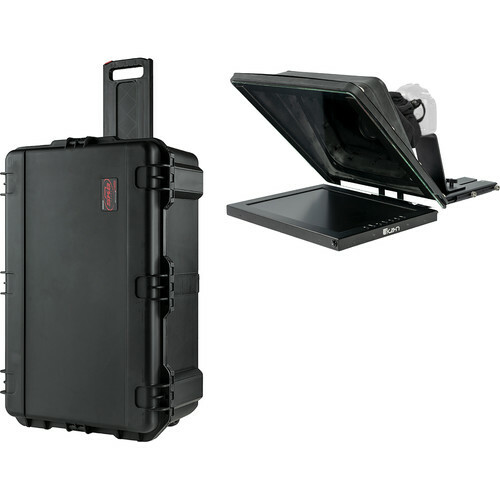 Work with talent on the go with this Professional 15" High-Bright Teleprompter Travel Kit from ikan. This kit includes a bright, 1000 cd/m², 15" LED monitor, 70/30 beamsplitter glass, a wheeled carry case, and all the hardware you need to mount it. Professional 15" High-Bright Teleprompter Travel Kit is rated 4.0 out of 5 by 1. Rated 4 out of 5 by Stephanie from Great Teleprompter, Great Support, Poor Software Just got this for a day of shooting talking head corporate social videos for a national brand client. Its easy to setup and their video on the site is SUPER helpful, I wish all companies did this. The clarity is fantastic and all the talent had a very easy and comfortable experience with it. I love the SKB case and that I can travel with it. It feels robust and professional and takes only a minute to setup. I used it with a Sony FS-5 and the Fujinon CineZoom Mk 18-55 T2.9 lens and it worked well even with a really long lens on it. The weight and balance is pretty good even with a load like this. Id recommend using a heavy duty tripod with this as you will have quite a bit of weight especially if you kit out your setup, which I did. So here are some things I noticed that could be better. Keep in mind I believe Ive received one of the few that have been sold thus far and Im sure ikan will improve these things. 1. I found several loose screws and a few fasteners floating around in the case upon opening it the first time. So they may want to check faster tightness before packing at the factory. 2. The software is a giant pain to get setup and get registered. Its actually made by a 3rd party and not by iKan. However iKan was EXTREMELY helpful in getting the 3rd party to assist which they did but it took 3 days and had me rushing to acclimate myself to it just before the shoot. Not a good thing. 3. The software needs more functions like presetting a desired scroll rate numerically and running that each time you trigger it. It also needs to have a proper full screen mode on the prompter display with side margin settings to control eye movement better. Overall I am pleased with the product and I look forward to improved software over time.